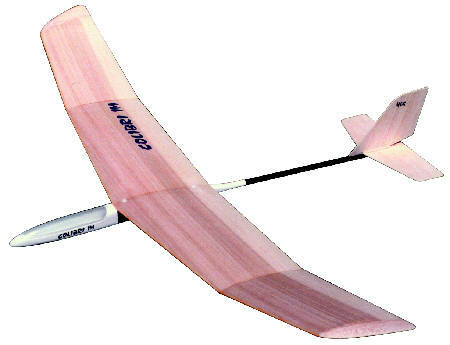 The Colibri is a very lightly constructed, high performance, 1-meter hand launch or slope sailplane. Its lightweight flying mass and composite materials construction makes it surprisingly rugged. Colibri is well suited to beginner pilots due to its toughness and good handling characteristics. The 80% ready to fly Colibri is a high quality model. The Colibri represents both original and modern construction. Its fuselage pod is made from prepainted, molded, aircraft industry grade, epoxy-fiberglass materials. Its tail boom is a stiff, light, graphite tube. The wings are precision cut from virgin white polystyrene foam. The ultra thin black poplar veneer is bonded to the foam with epoxy in a high pressure mold for perfect airfoil fidelity and a warp-free wing. The stabilizers are made from lightweight balsa, finish sanded, and pre-hinged.